Iodine deficiency is a problem affecting approximately 100 million people around the world. 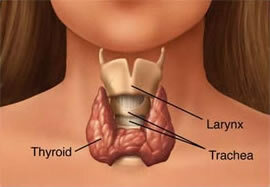 Iodine is used by the thyroid to produce hormones. Although prevalent before the 1950s in the USA, iodine deficiency has been virtually wiped out by the use of iodized salt. Excessive iodine is found in a number of drugs and some cough syrups, and might cause the thyroid to produce either too much or too little hormone in some individuals. 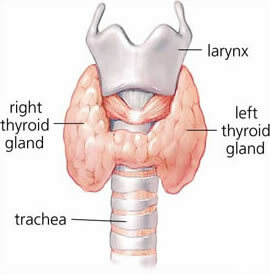 The thyroid is a small gland, shaped like a butterfly, that rests in the middle of the lower neck. Its primary function is to control the body’s metabolism (rate at which cells perform duties essential to living). To control metabolism, the thyroid produces hormones, T4 and T3, which tell the body’s cells how much energy to use. A properly functioning thyroid will maintain the right amount of hormones needed to keep the body’s metabolism functioning at a satisfactory rate. 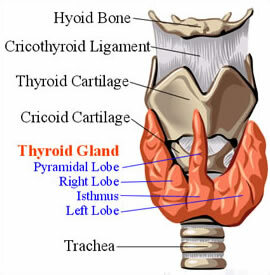 As the hormones are used, the thyroid creates replacements. 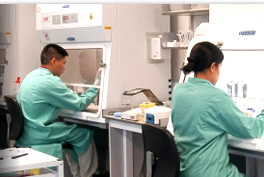 The quantity of thyroid hormones in the bloodstream is monitored and controlled by the pituitary gland. When the pituitary gland, which is located in the center of the skull below the brain, senses either a lack of thyroid hormones or a high level of thyroid hormones, it will adjust its own hormone (TSH) and send it to the thyroid to tell it what to do. The goal of treatment for any thyroid disorder is to restore normal blood levels of thyroid hormone. Hypothyroidism is treated with drug. With careful monitoring, your doctor will adjust your dosage accordingly, and you’ll soon be able to return to your normal lifestyle. Hyperthyroidism, generally more difficult to treat, requires the normalization of thyroid hormone production. Treatment could involve drug therapy to block hormone production, radioactive iodine treatment that disables the thyroid, or even thyroid surgery to remove part or the entire gland. Thyroid diseases are life-long conditions. With careful management, people with thyroid disease can live healthy, normal lives.